Max Waechter and Madison Kackley were the invitational winners at the Pacific Tiger Invitational on Saturday at the Elkhorn Golf Course in Stockton. Waechter, a senior from Brentwood Heritage, won the Large School Senior race, covering the 5,000-meter course in 15:40.70, the No. 5 time among 5K leaders in CA so far in 2018. Westmont (CC) junior Garrett MacQuiddy was second (15:45.10) and Doughterty (NC) senior Lucas Badcock was third (15:46.70). MacQuiddy's time ranks No. 9 in CA for 5K and Badcock is 11th. Godebo Chapman (James Leash photo at right), a sophomore at Hiram Johnson West Campus (SJ), won the the Varsity Boys Small Division in 15:46.10, the No. 10 time for 5K in the state. Kuckley, a sophomore at Joseph A. Gregori (SJ) got a nice push from Kate Tavella to win the Varsity Girls Large Division race in 18:17.60. 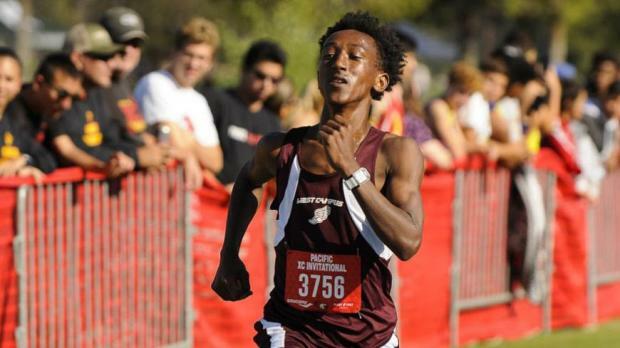 Tavella, a senior at San Ramon (NC), was second in 18:20.90. Those rank Nos. 7 and 9, respectively, for 5K in the state based on processed results as of Sunday evening. Rachel Burgoyne, a senior at Vista del Lago (SJ), won the Small Division race in 18:19.40 with Haleigh Humble from Oakdale (SJ) second in 18:27.70. Burgoyne's time ranks No. 8 in the state and Humble slots at No. 11. 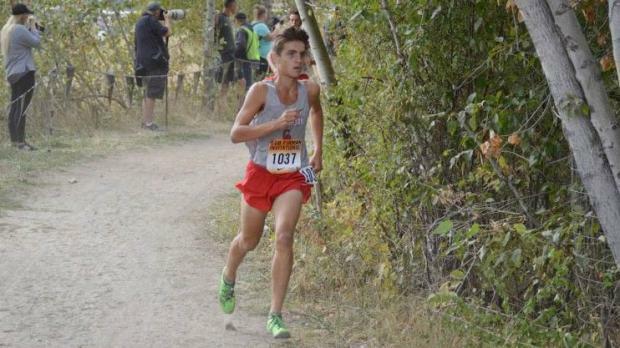 The 5K rankings in CA took a heavy overhaul this week -- again, based on processed results as of Sunday evening. Buchanan junior Corie Smith blistered the 5K track at the Douglas P. Rudolf Invitational in Visalia, clocking 17:25.31, No. 1 in CA and No. 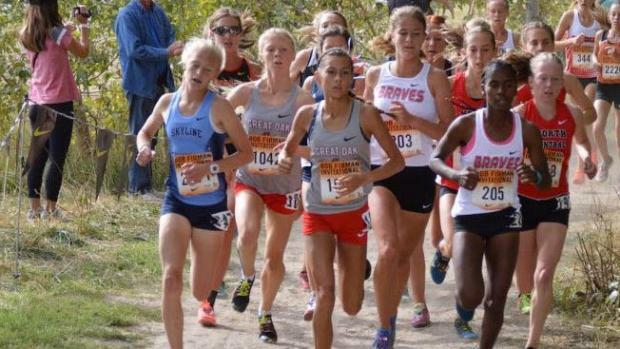 15 U.S.
Two other juniors, Tori Gaitan (17:53.50) and Arianna Griffiths (17:57.40) of Great Oak, went 1-2 at the Bob Firman Invitational outside of Boise with the Nos. 2 and 3 times in CA (Bryan Deibel photo at right). Also rocking the Idaho course were Palos Verdes junior Savannah Scriven (18:12.30) and Mission Viejo senior Kelli Hines (18:15.50), Nos. 4 and 5, respectively. Smith and the results from Bob Firman pushed previous CA leader Quinn Hagerman out of the top five. The senior at Merced is now No. 6 at 18:15.90 based on her clocking at the Central California Conference (CCC) meet on Sept. 12. In the boys rankings, Great Oak junior Gabriel Abbes placed eighth at Bob Firman in 15:31.80, with senior teammate Tyler Tickner just behind in 10th (15:35.50). Those are now the top two 5K times in CA. 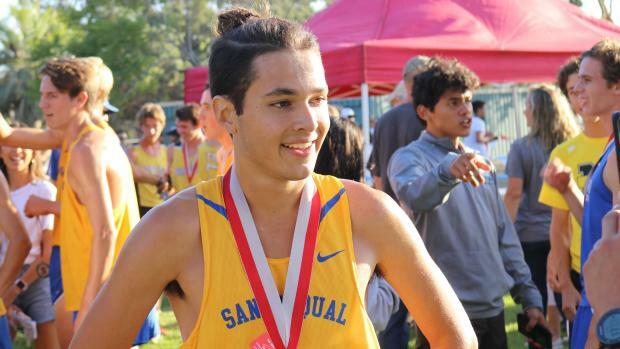 San Pasqual (SD) senior Franky Varela's impressive 15:40.00 at the South Bay Invitational on Friday slotted him in fourth, one second behind Marina (CC) senior Christopher Plasce, who cranked out a 15:39.00 at the PACAL Mission Center Meet on Wednesday. 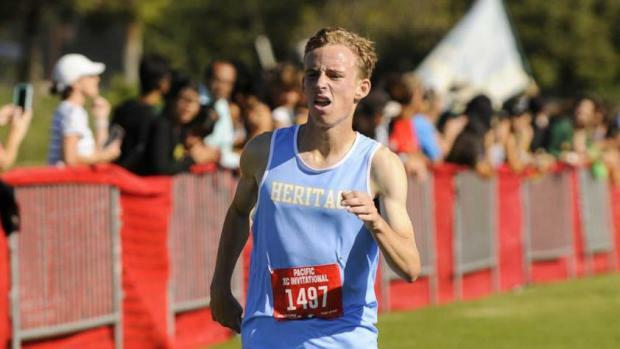 Waechter's time is just ahead of Monache senior Ivan Mendez, who like Smith on the girls side, blistered the Rudolf Invitational course in 15:42.37. Two more Great Oak standouts complete the top eight: junior Chris Verdugo (15:44.10) and senior Cameron Hylton (15:45.00), both from Bob Firman.